میرزائی, محمد, محب الحجه, علیرضا, احمدی گیوی, فرهنگ. (769). حساسیت تولید امواج گرانی- لختی به درجه کژفشاری در مدل دولایه‌ای روی کره. مجله ژئوفیزیک ایران, 5(1), 109-123. محمد میرزائی; علیرضا محب الحجه; فرهنگ احمدی گیوی. "حساسیت تولید امواج گرانی- لختی به درجه کژفشاری در مدل دولایه‌ای روی کره". مجله ژئوفیزیک ایران, 5, 1, 769, 109-123. میرزائی, محمد, محب الحجه, علیرضا, احمدی گیوی, فرهنگ. (769). 'حساسیت تولید امواج گرانی- لختی به درجه کژفشاری در مدل دولایه‌ای روی کره', مجله ژئوفیزیک ایران, 5(1), pp. 109-123. میرزائی, محمد, محب الحجه, علیرضا, احمدی گیوی, فرهنگ. حساسیت تولید امواج گرانی- لختی به درجه کژفشاری در مدل دولایه‌ای روی کره. 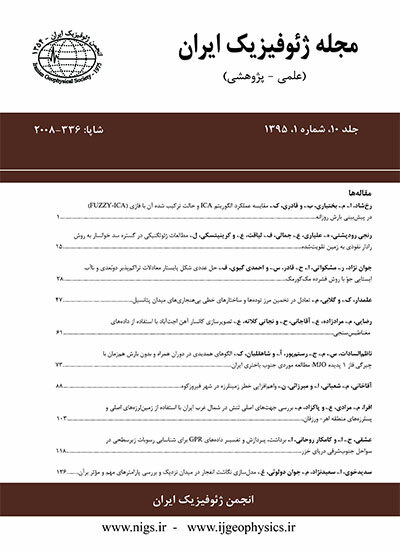 مجله ژئوفیزیک ایران, 769; 5(1): 109-123. در این مقاله، شبیه‌سازی ایده‌آلی از تولید امواج گرانی– لختی در‌ شارش تاواری در یک مدل عددی شامل معادلات بسیط روی کره با دو لایه هم‌دمای پتانسیلی و کاربست الگوریتم عددی فرابرد پربندی نیمه‌لاگرانژی برای حل معادلات، صورت می‌گیرد. شرایط اولیه مدل برای چهار آزمایش شامل یک جت متوازن با دمای پتانسیلی یکسان در لایه زیرین و دمای پتانسیلی متفاوت در لایه بالایی است. نتایج بیانگر آن است که بیشینه میانگین آهنگ رشد ناپایداری در آزمایش اول رخ می‌دهد و با افزایش پایداری ایستایی، میانگین آهنگ رشد کاهش می‌یابد. همچنین در آزمایش اول، تولید دو بسته موج گرانی– لختی یکی در پایین‌دست ناوه و دومی در بالادست آن مشاهده می‌شود؛ درحالی‌که در آزمایش دوم، فقط تولید بسته‌موج بالادست ناوه وجود دارد و در آزمایش‌های سوم و چهارم، دیگر نشانی از تولید دو بسته‌موج فوق نیست. قله انرژی در دسترس نامتوازن نیز بیشینه مقدار را در آزمایش اول دارد و با افزایش پایداری ایستایی، از مقدار آن کاسته می‌شود. The generation of inertia–gravity waves (IGWs) in the idealized simulation of vortical flows is investigated using the isentropic two-layer, primitive-equation model on the sphere. The contour-advective semi-Lagrangian (CASL) algorithm is used to solve the primitive equations in potential vorticity, velocity divergence, and acceleration divergence representation. The CASL algorithm consists of both Lagrangian and Eulerian parts. The Lagrangian part addresses the potential vorticity equation, which is solved by contour advection. The Eulerian part addresses the remainder of the model including the prognostic and diagnostic equations for the grid-based variables of velocity divergence, acceleration divergence and the depth. The Eulerian part is solved by the spectral transform in longitude, the forth-order compact differencing in latitude, and a three-time-level semi-implicit scheme in time. The power of CASL rests in its ability to represent the fine-scale structures in potential vorticity. Therefore, using CASL, it is possible to determine more precisely the generation and propagation of the IGWs generated by vortical flows. The initial state of the numerical experiments is comprised of a balanced, zonal jet with a very small perturbation added to trigger instability. With regard to the balanced initial conditions used, the IGWs are generated mainly through spontaneous-adjustment emission. To determine the sensitivity of the IGWs generated to the degree of baroclinicty, four experiments were carried out in which the upper-layer potential temperature was set to 310, 315, 320, and 325K from the first to the fourth experiment, respectively. The lower-layer potential temperature was set to 280K in all of the experiments. As a result of increasing the upper-layer potential temperature, the static stability increased and thus the baroclinicity decreased from the first to the fourth experiment. To identify the IGWs accurately, the Bolin–Charney potential vorticity inversion was used to decompose the flow into a balanced part representing vortical flow and an unbalanced part representing free IGWs. The analysis of the average growth rate of the baroclinic waves shows that the first experiment has the maximum average growth rate among the four experiments. Increase in static stability from the first to the fourth experiment led to a decrease in the average growth rate, but the time of occurrence of the peak in growth rate increased. The investigation of the unbalanced velocity divergence shows the generation of two wave packets of IGWs during the evolution of the vortical flow in the first experiment; one wave packet on the downstream side of the trough, similar to the mesoscale waves described by Zhang (2004), and the other wave packet on the upstream side of the trough, similar to the wave packet described by Plougonven and Snyder (2007) in idealized simulations of baroclinic life cycle dominated by cyclonic behavior. The intrinsic frequency of both wave packets is close to that found by Wang and Zhang (2007) for the low static-stability experiment. The upstream wave packet appears in the second experiment, but failed to reach noticeable amplitude in the third and fourth experiments. The effect of increasing static stability is even more dramatic on the downstream wave packet, which is identifiable only in the first experiment. Unbalanced linearized available energy (LAE) is used to quantify the strength of the IGWs. The results show that, consistent with the formation of two wave packets, only the first experiment that reached the maximum value of the unbalanced LAE. Due to increased static stability, there is a considerable reduction in peak value of unbalanced LAE. For example, the ratio of the peak of unbalanced LAE in the first experiment is 86 times as great as that of the fourth experiment. Another way to observe the substantial differences in the strength of the IGWs is to measure the maximum norm of the unbalanced velocity divergence. Before and after reaching the peak of the unbalanced LAE, the maximum norms of the unbalanced velocity divergence in the first experiment were between 15 and 21 times as great as the corresponding values in the fourth experiment.